When you use Max for Live to create new devices, you always begin from a basic template - a Max device that contains the necessary Max objects for receiving and transmitting audio or MIDI data to and from other devices in the Devices area of a Live track. When you edit a Max device, you launch the Max application, but you can continue to listen to your device in Live as you edit it thanks to a feature known as preview mode. More information about preview mode. 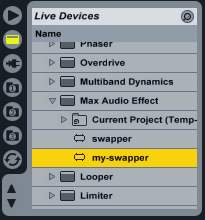 When your Max for Live device is complete, you can save it (along with any presets you may wish to create) in a central library that allows you to load your patch or preset from the Live File browser at any time in the future. Click on the Devices button in Live's File browser to display the list of available devices. 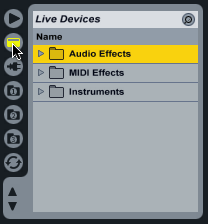 Click on the arrow to the left of the folder marked Instruments, MIDI Effects, or Audio Effects to show the available devices and their presets. Each of these folders contains a Max template "starter" device you can use when creating Max for Live devices. A device called Max Instrument is listed in the Instruments folder. It can be inserted on a Live Audio track or on a Live Instrument track to process audio from a synth device. A device called Max Instrument is listed in the Instruments folder. 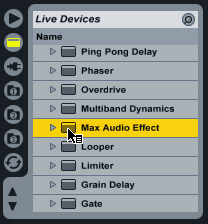 A device called Max MIDI Effect is listed in the MIDI Effects folder. These devices can only be inserted on Instrument tracks. 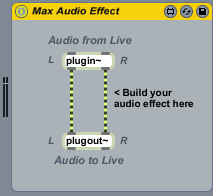 Click on a Max for live device in Live's File Browser and drag it to the Devices Window for a Live Track. A device window that contains a simple Max patch will appear. Each patch contains the necessary Max objects and the connections necessary to pass audio and/or MIDI between any audio or MIDI devices you have inserted before or after the Max device. Note: Max for Live files have their own file format (.amxd) which cannot be edited outside of Max for Live. You can drag an .amxd file using your computer's Finder into the Live Devices area to load the file, and you can also drag an .amxd file from your mailbox to load it. To save a device, click on the close button in the patcher's title bar or choose Save from the Max File menu. If you are saving a newly created device, a file dialog will appear and ask where you want to save the file. If you do not explicitly specify a location to save your device, it will be saved in a default location inside Live's device library, where it will be available from Live's Browser. 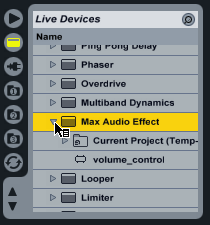 To see the current library of available devices, click on the arrow to the left of any of the three Max for Live device folders (the Max Audio Effects folder in the Audio Effects folder, the Max MIDI Effects folder in the MIDI Effects folder, or the Max Instruments folder in the Instruments folder. The folder will open and any saved devices will be displayed. Note: You can save a Max for Live device to any other location you wish, but it will not be displayed or available to Live's File Browser. Max for Live contains a number of helpful examples and tutorials that you can use as starting points for your own investigations or creations. Any time you open one of these devices and decide to modify its contents, you should save your work as a copy of the existing patches that come with Max for Live to avoid problems associated with overwriting the original devices. 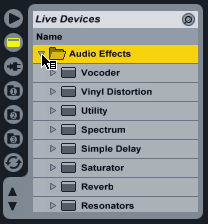 To save a copy of a Max for Live device you want to edit, choose Save As... from the File menu. A file dialog will appear so you can give your device a new name. If you do not explicitly specify a location to save your device, your copy will be saved in a default location inside Live's device library, where it will be listed in Live's file browser. When you save the device, the copy in Live will update automatically. Note: You can save a device to any location you wish, but it will not be displayed in Live's file browser. We recommend that you save Max devices inside the Live library.